Rockhurst University is accredited by The Higher Learning Commission of the North Central Association, 230 South LaSalle Street, Suite 7-500, Chicago, IL, 60604, www.ncahlc.org, (800) 621- 7440. Additionally, specific programs include accreditations by AACSB International-The Association to Advance Collegiate Schools of Business (undergraduate and master’s degree programs), 777 South Harbour Island Boulevard, Suite 750, Tampa, FL, 33602-5730; the Accreditation Council for Occupational Therapy Education of the American Occupational Therapy Association, 4720 Montgomery Lane, Ste. 200, Bethesda, MD, 20814-3449; the Commission on Accreditation in Physical Therapy Education, 1111 N. Fairfax St., Alexandria, VA, 22314-1488; the American Chemical Society, 1155 Sixteenth Street, NW, Washington, DC 20036, www.acs.org; the Commission on Collegiate Nursing Education, One Dupont Circle, NW, Suite 530, Washington, D.C., 20036; the Council on Academic Accreditation in Audiology and Speech-Language Pathology (CAA) of the American Speech-Language and Hearing Association, 2200 Research Blvd., #310, Rockville, MD, 20850-3289 (master of science education program); the Teacher Education Accreditation Council, One DuPont Circle NW, Ste. 320, Washington, D.C., 20030, and the Missouri Department of Elementary and Secondary Education, and the Missouri Association of Colleges of Teacher Education. The University holds memberships in the American Council on Education, the Association of American Colleges, the American Association of Colleges for Teacher Education, the American Association of Colleges of Nursing, the American Physical Therapy Association, the Council of Academic Programs in Communication Sciences and Disorders, the National Council for Undergraduate Research, the Nonprofit Academic Centers Council, the Institute for International Education, the Council for International Educational Exchange, the Association of Catholic Colleges and Universities, the Association of Jesuit Colleges and Universities, the Missouri Association of Colleges and Universities, the Missouri Colleges Fund, Inc., the Council of Independent Colleges, The College Board, and the Council of Graduate Schools. The University is an affiliate of Nonprofit Leadership Alliance and the Nonprofit Academic Centers Council and partners with the Association of Fundraising Professionals (AFP) Mid America Chapter. This Rockhurst University 2018-2019 Catalog is for informational purposes and does not constitute a contract or part of a contract between Rockhurst University and any student. Information in this Catalog concerning academic programs, tuition, financial aid, academic rules and regulations, and faculty is current as of August 1, 2018. Programs and program requirements and University policies and procedures can and do change from time to time for the improvement and development of academic offerings of the University, to reflect advancement in higher education, and for compliance with applicable law. 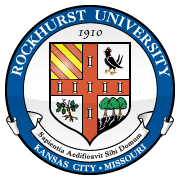 The program and degree requirements specified in this publication apply to students who commence their studies at Rockhurst University during the 2018-2019 academic year, and who remain in continuous enrollment at the institution until they are graduated. Individual schools and departments may have additional degree and other requirements. Students and prospective students should contact the administrative offices of both the school and the department of the program in which they are enrolled or to which they are applying for information on those requirements. Although requirements are subject to change without notice, as a general rule, and whenever possible, students may elect to comply with the new requirements of a later catalog, or to remain under the requirements set forth in the catalog in effect when they began their studies (provided they have maintained continuous enrollment). Students who do not maintain continuous enrollment must satisfy the academic requirements of the catalog under which they re-enroll. Students who change their major may be bound by the regulations for the new major that are in effect the semester when they declare or change their major and officially begin studies in that program.